Calabanga, Cam Sur, May 3 — Just when the whole nation is on tight watch of the Manny Pacquiao and Floyd Mayweather boxing bout, here in the Bicol region, more specifically in Sorsogon province, concerned government agencies are closely monitoring Mount Bulusan after the volcano spewed steam and ash on Friday. 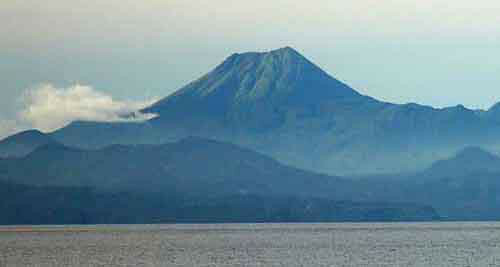 File photo of Sorsogon's Mt. Bulusan viewed from a distance. Residents are cautioned to take precautionary measures near the area that might get direct effect should a stream-driven or phreatic eruption occurs. The Bicol Regional Risk Reduction Management Council and other government agencies are monitoring the situation to ensure the danger zone is off limits to the public. This entry was posted in BICOL NEWS NOW, NEWS and tagged Bicol Regional Disaster Risk Reduction and Management Council, Mt. Bulusan, National Disaster Risk Reduction and Management Council, Sorsogon, volcanic eruption. Bookmark the permalink. Nakikisabay sa attention parayo sa boksing.